Cheye-Ann Corona is a Mexican-American from California’s San Gabriel Valley, located in Los Angeles County. She graduated from the University of California, Los Angeles (UCLA) with a bachelor’s degree in international development studies in 2008, and received a joint master’s degree in urban planning and Latin American studies in 2011. Cheye-Ann has over eight years of experience advocating for viable public policy reforms that provide economic, political, and social mobility for marginalized communities of color. As an undergraduate at UCLA, Cheye-Ann was a Community Development and Social Justice Scholar and active in the campus’ workers rights movement. As a graduate student, she was the co-chair of Planners of Color for Social Equity and the external vice president for UCLA’s Graduate Student Association. Throughout this time, Cheye-Ann helped sustain a statewide coalition of students, faculty, and staff to advocate against significant budget cuts to public higher education that disproportionately affected low-income and racial/ethnic minorities throughout California. Notably, her programming and leadership skills resulted in the first Diversity, Equity and Inclusion Orientation for incoming graduate students of color at UCLA. As an urban planner, Cheye-Ann has been involved in land-use issues around affordable housing, environmental justice, and inclusive zoning. Using innovative media strategies, she has designed community-based campaigns for communities like South Central LA and Boyle Heights in their fight to fend off the negative implications of gentrification. 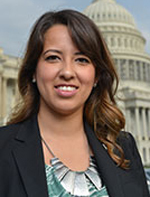 For the past three years, Cheye-Ann has worked in the California State Assembly as a district representative and senior legislative aide for Assembly Member Roger Hernández, managing a diverse portfolio of legislative issues for the district. As a CHCI Housing Graduate Fellow, Cheye-Ann is excited to build upon her unique advocacy and planning background to be an effective advocate for viable housing and development policies that empower the Latino community and other communities of color.